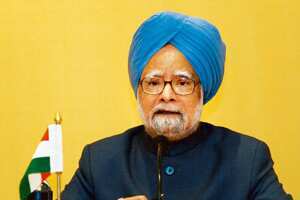 New Delhi: Prime Minister Manmohan Singh said the world’s most powerful economies should shield developing nations from the global financial crisis. “I will put forward our views on the need for a greater inclusivity in the international financial system, the need to ensure that the growth prospects of the developing countries do not suffer, and the need to avoid protectionist tendencies," he said before his departure for Washington. Leaders from the Group of Twenty (G-20) nations, including Singh, are meeting in Washington on 15 November to discuss the turmoil that has roiled the financial markets and threatens a global recession. Singh, a former central bank governor and finance minister, was speaking after a meeting of the Bimstec (Bay of Bengal initiative for multi-sectoral technical and economic cooperation) group of countries, which includes Bangladesh, Myanmar, Sri Lanka, Thailand, Bhutan and Nepal, apart from India. The Prime Minister also called for the strengthening of the global financial institutions. Also Read Will G-20 see a new global financial order? “The international institutions, both IMF (International Monetary Fund) and the World Bank, and regional development banks must be strengthened to ensure that the fallout on the developing countries of the global crisis is minimal," Singh said. Finance minister P. Chidambaram and deputy chairman of Planning Commission Montek Singh Ahluwalia would accompany Singh to the G-20 meet. The meeting of the G-20 countries, which include the US, the UK, China, Japan, Australia and India, was called by US President George W. Bush to discuss issues concerning the global financial crisis. The finance ministers and central bank governors of the G-20 countries have recently met at Sao Paulo in Brazil to prepare the groundwork for the G-20 summit.